The first question that usually comes up when it comes to All-Area teams is who makes the selections and what factors are considered. It’s a rather complicated answer but here goes. Let’s talk specifically football. The teams are picked by the sports writer with input from area coaches. I picked the one for the Daily Bulletin while Pete Marshall handled the one for the Sun. There are some common selections but the coverage areas vary slightly. Football is particularly difficult because of the numbers of players/positions and the number of schools. Naturally consideration is skewed a bit in favor of teams that win a league title or make the playoffs but that doesn’t mean players on sub-par teams aren’t considered. I went to a game involving a team I knew wasn’t going to make the playoffs on one of my nights off just to look at a particular player who I knew I’d have to make a call on in the end. I did take the All-League lists and examine them closely but those aren’t the answer either because there can be biases there as well. Yes statistics are factored in, but so is the level of competition. Injuries are a factor too depending on the number of players at a particular position. There were a handful of positions where a tough call had to be made. There were some instances where I was down to a couple of players and then tried to get some final input of coaches from teams who played against both. Often times the toughest call is how players from much smaller schools factor in when those teams are quality but the level of competition they face as a whole is significantly lower. I agonized but once the selections were made I felt good about the final outcome. The better teams had more representation. But in all, 17 schools had a player on first team and 29 had a payer mentioned somewhere. That’s pretty good balance. I also tried to limit the number of players picked. We had a first and second team and an honorable mention which is the equivalent of a third team. 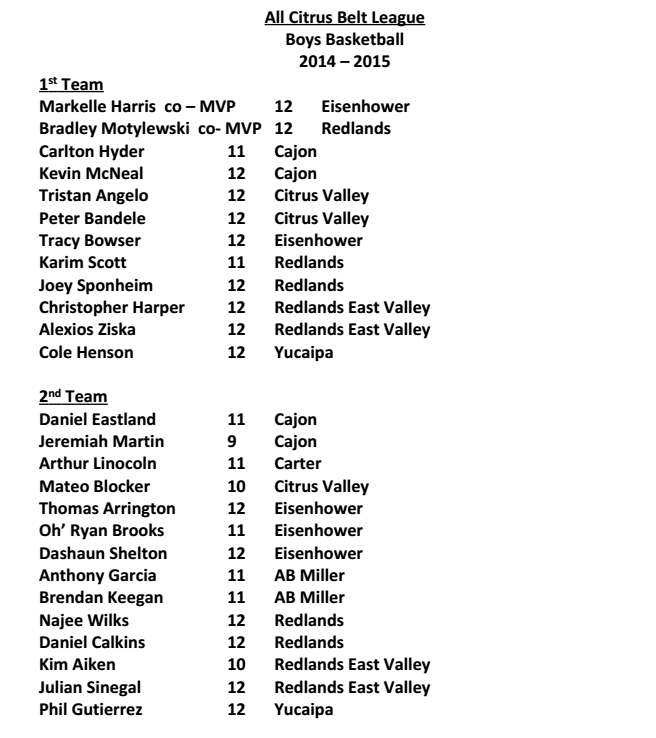 I had the authority to put as many players as I wanted on honorable mention but wanted to keep it to 20-25 players. The more players you pick, the less of an honor it really is. I wanted those on honorable mention to feel that was an “honor” not a consolation for not making first or second team. So congratulations to those making the cut. To those that didn’t, know I really deliberated and considered all variables. Athletes of the Year – Adam Goss, Sr., South Hills; Donavin Washington, Sr., Charter Oak; Eric Prevost, Sr., Charter Oak. Honorable mention – Chris Salcido, San Dimas; Justin Padilla, Baldwin Park; Erik Williams, Covina; Ricky Beltran, San Dimas; Dequan Earl, Pomona; Anthony Guardado, Nogales; Robert Conway, Wilson; Jaron Reed, Northview; Aaron Ballard, Wilson; Jason Wallace, San Dimas; Rocky Mosqueda, Nogales; Andrew Guevara, Covina; Erik Hurrola, Wilson; Anthony Montez, Pomona; Ronnie Silva; Alberto Valenzuela, Baldwin Park; Mateo Ovalle, Nogales; Austin Maldonado, Wilson; Ryan Caveness, Covina; Oscar Sandoval, Wilson. 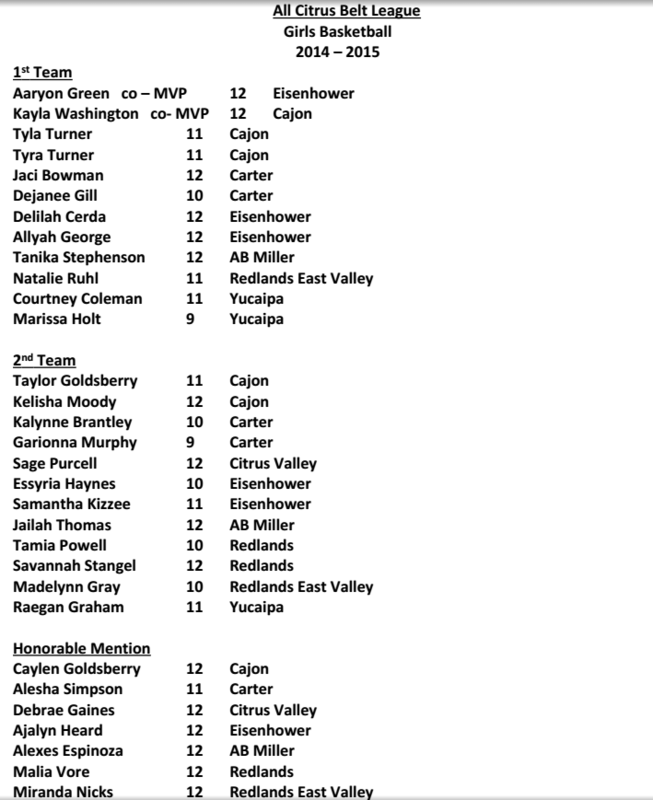 Honorable mention – Jamie Apusen, Nogales; Chantel Avila, Pomona; Dani Bezanson, Wilson; Cami Buckman, Covina; Guadalupe Figueroa, Pomona; Indira Gante, Pomona; Sara Harding, Covina; Serena Hausman, Covina; Jessica Hine, San Dimas; Nancy Lopez, Nogales; Tanya Lopez, Baldwin Park; Megan Macasaet, Northview; Ashley Rendon, Nogales; Anabelle Ruiz, Pomona; Raquel Tirado, Northview.